Fancy design Link Sterling Silver Bracelets. Bracelets in various exciting styles from Box or Snake design to Hollow Beaded or Twisted Rope 925 Sterling Silver wholesale Bracelets. Sterling Silver popular Box style link Bracelet in approx. 200mm length. STERLING SILVER BEADED BRACELET. approx 190mm length. Quality lobster claw clasp. Beaded bracelet. 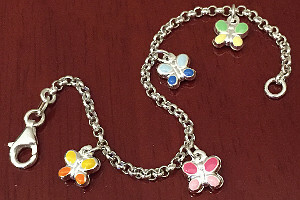 Sterling Silver enamel Butterfly Charms 6 inch (155mm) Childs Bracelet. 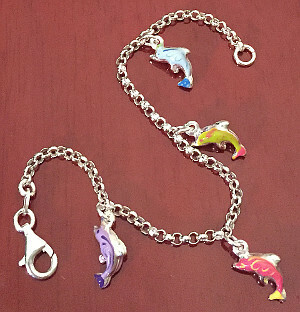 Sterling Silver colour Dolphins enamel childs Charm Bracelet 6inch length (155mm). 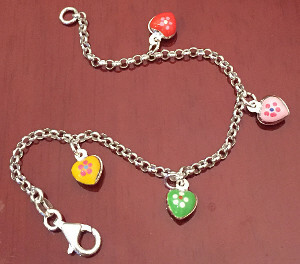 Enamel coloured Hearts Childrens Charm Bracelet Sterling Silver, 155mm (6 inch) length. United Colors of Benetton Red and Blue enamelled Beads designer Branded silicone Bracelet, urban designer jewellery. Coloured Crystal set Sterling .925 Silver cord Bracelet. 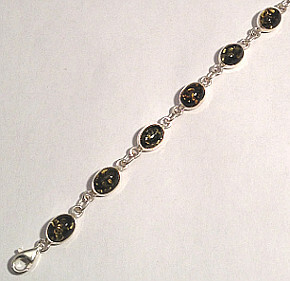 Coloured cord bracelet with matching Coloured Crystal Stones set in Sterling .925 Silver. Silver Lobster claw clasp. Stones set coloured Bracelet. 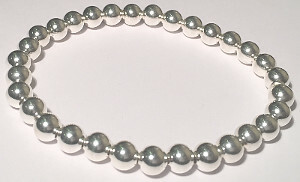 Wide Sterling 925 Silver Oval Beaded Bracelet, 190mm length x 4mm wide. Sterling Silver round beads stretchy Bracelet, approximately 165mm length. Silver 925 stretch beaded bracelet with 5mm beads. 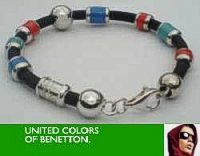 United Colors of Benetton branded Sterling Silver polished Beads and Silicone Modern Urban Fashion Bracelet with Blue enamel detail. 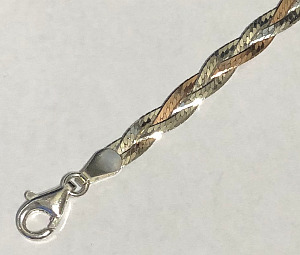 Sterling Silver fluid HerringBone design super flexible Ladies Bracelet, 190mm length. One side of bracelet has Star design and the other side is plain. Sterling Silver 190mm length Herringbone design Bracelet with lobster claw clasp. Plain design 190mm length x 4mm gauge. 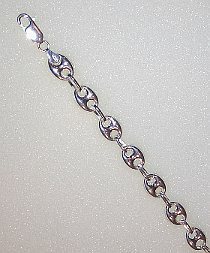 Sterling Silver 2 bar style Gate Bracelet in 7inch length, approx 5mm wide. 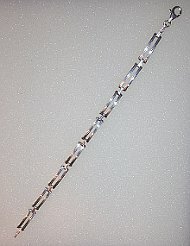 Sterling Silver Gate Bracelet in 8 inch length (205mm). 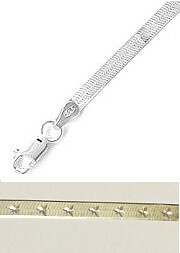 2 bar design 5mm wide Gate Bracelet with trigger fastener clasp. 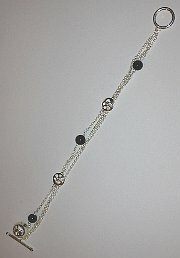 Sterling Silver triple strand T-Bar Bracelet set with Onyx Beads, Flower design and Silver Bead. 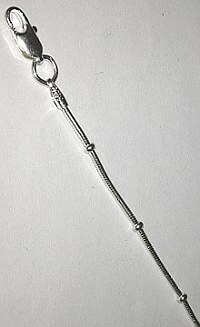 Two bar 925 Sterling Silver Gate Bracelet in 7inch (180mm) length and 3mm gauge width. 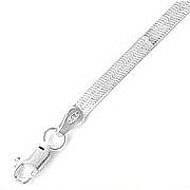 Sterling 925 Silver 3mm wide Gate Bracelet in 205mm (8inch) length. Gate Bracelet with 2 bars design at 3mm gauge width. Ladies Sterling Silver Clear CZ set Bracelet. Stunning sparkling Bracelet set with Marquise cut CZ stones and Round cut CZ Stones. 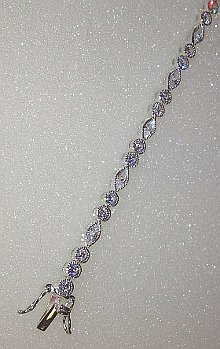 Length 190mm (7 ½ inch) Ladies Brilliant bright Cubic Zirconia Bracelet. Sterling Silver Square design Bracelet set with brilliant Square shape Cut Black & Clear Cubic Zirconia Stones. 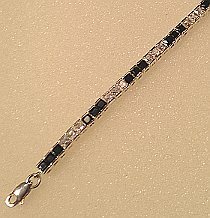 190mm approx 7.5inch length ladies bracelet. Stones arranged to form Black and White pattern of 3 Black stones then 3 Clear Stones. Very Elegant Popular 925 Bracelet. Fancy Oval links Mariner Sterling Silver Bracelet, 190mm length. Wide 9mm oval shaped links. 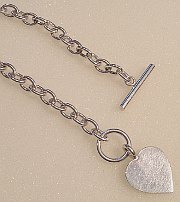 Sterling Silver Heart Tag Bracelet with T-Bar Toggle and classic large Heart Tag. 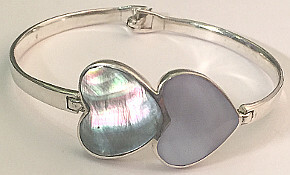 Sterling Silver alternate sized open Hearts Bracelet. 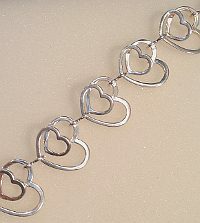 Hearts design Bracelet with solid and Open design Hearts in line along 190mm long bracelet. Sterling 925 Silver 11mm wide ladies bracelet with trigger clasp. 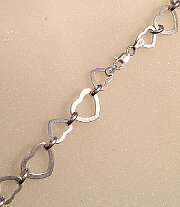 Sterling Silver bracelet made from heart shaped links with large Wavy design Hearts attached. 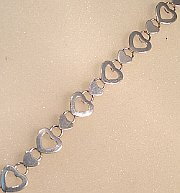 Approximately 190mm long solid 925 Silver ladies bracelet with Trigger Clasp and solid wavy hanging Hearts. Large heart size approx. 18mm across. 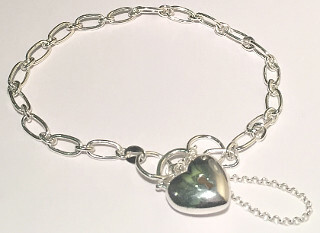 Heart Charms bracelet with belcher style link in Sterling Silver. approx. 12mm wide by 190mm length. 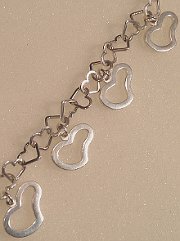 fancy dangling Hearts ladies bracelet. 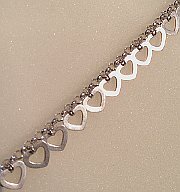 Massive solid Sterling Silver Double interlocking Hearts Bracelet, approx. 200mm long and 22mm wide. Sterling Silver 190mm (7.5inch) Bracelet set with genuine Cognac Amber stones in rectangular shaped bars bracelet setting, approx. width 3mm. Sterling Silver Herringbone snake Woven 185mm Bracelet 6mm wide. Sterling Silver Heart Padlock clasp Charm Bracelet 180mm. 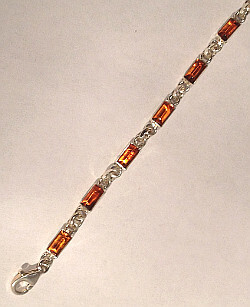 Amber Tri-Colour Sterling Silver Bracelet in 7inch length (180mm). 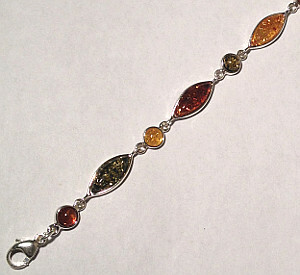 Stunning bracelet set with Green, Cognac and Yellow Genuine Amber stones, width 7mm x 180mm length. Sterling Silver Bracelet set with real Green Amber oval approx. 8mm x 6mm size cabochon stones. Length 190mm (7.5inches). Sterling Silver two tone colour with rose gold plating double woven herringbone design bracelet, approx. 200mm 8inch length x 5mm wide.